Our auditors ensure to supply a high quality range of Hospital Equipments and supplies. These are known for their fine finish, accurate dimensions, low maintenance requirements and robust construction. There is a great demand for these in clinics, hospitals, medical and surgical centers. Our valued customers can avail from our quality Medical Oxygen Therapy Units Portable and Trolley Mounted at highly competitive prices. 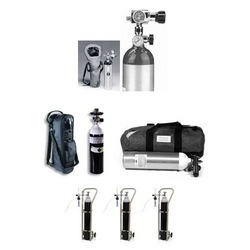 These units include oxygen therapy equipment, central gas pipeline equipment and anesthesia machine. Our equipment are widely acclaimed for their excellent performance, high efficiency and durability. 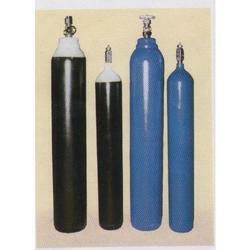 We are the manufacturer of Oxygen Cylinder for use in ward. The products we manufacture are made up of advance quality of raw material to get a fine output and are demanded in the various medical industries. 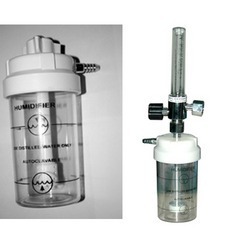 These medical oxygen cylinder are available in the range of high-quality, high-performance. This medical oxygen cylinder is highly in demand due to its excellent features. 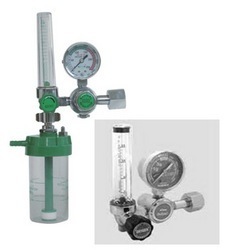 Single Stage and Double Stage Regulators are used on medical cylinders, anaesthetic and oxygen therapy apparatus not only to reduce the high cylinder pressure, but also to keep it constant. 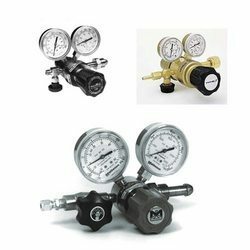 Incorporates a high quality colour coded pressure gauge [0-250 bar] for medical use. High tensile brass forged main body, bonnet and components of extruded brass rod [bs : 1001/cz 115] duly bright chromium plated for optimum safety & attractive clinical appearance. High quality neoprene rubber made diaphragm and seat valve an in built safety valve system eliminates chances of a high pressure build up in the regulator. Medical Regulator with Flowmeter manufactured by us is famous amongst our clients for optimum performance and accurate design. These are availed with pressure release valves and they are highly durable and reliable. They are fabricated using cutting edge technologies to ensure the quality standards. We are a renowned manufacturer and exporter of Humidifier Bottle. The humidifier bottle offered by us, is unbreakable and has compact size and accurate design. Our humidifier bottle is widely used for oxygen therapy. This maintenance free bottle can easily disassembled as well as reassemble for the cleaning and checking along with the replacement of metering tube. Transparent Mask with Tubing meant to administer oxygen to patients. Transparent mask meant from special non-toxic medical grade PVC, Two holes to allow carbon dioxide exhaled by the patient to escape. Nasal clip for secure fixation over the patient’s nose. Elastic band for placement around the head with transparent tubing to connect the mask to the oxygen pipeline. 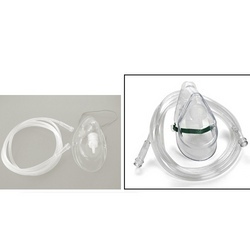 These mask are for use in hospitals and for medical use and are widely in demand. Our expert teams are engaged in manufacturing the high quality of Medical Trolleys which are manufactured by the excellent quality of raw materials. These products are highly demanded in health care centers and nursing homes, and can effectively serve our clients during operation, surgery and treatments. 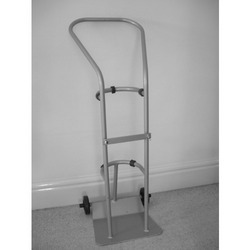 Looking for Hospital Equipments ?